Waterloo – Students in Wilfrid Laurier University’s Social Entrepreneurship Option, in collaboration with C3 Innovation Labs (C3IL), an experiential learning hub within the Faculty of Arts, will be hosting a holiday-themed night market on Nov. 25 in Waterloo Park. More than just a place to pick up great gifts, the students hope the market will also create opportunities for connections between permanent Waterloo residents and students. The Northdale and MacGregor-Albert neighbourhoods near Laurier’s Waterloo campus are made up of a large number of students, many of whom don’t stay longer than a year or two, and a few hundred long-term, permanent residents. Students in past social entrepreneurship courses have studied the two demographics and noticed they rarely connected. At local coffee shops, residents tended to meet in groups to socialize while students usually sat alone behind screens. Many students who lived in the area didn’t even know the name of their community and, when they went out for the night, they went uptown, rather than staying in their neighbourhood. A test run of the night market, Night Bites, was held at the end of October. That night, Jamal Khamis, who is helping to organize the night market as a student and C3IL intern, saw the beginning of a shift in attitude in both students and residents. “There were people hanging out that would never ever be together in the first place,” he said. Plans for the night market first began to come together when Samantha Sharratt, who was also in the Social Entrepreneurship Option, took it on as her fourth-year capstone course project. She wrote a report on the project, through which she explored what it would take to launch the Night Market as a regular event. After some initial delays in getting the initiative moving, Global Studies Professor John Abraham’s third-year class, “Developing a Social Venture,” picked up the project this September. The 17-student class divided into teams to help put the event together: promotion, logistics, participation and fundraising. The class is raising funds to help cover the costs of the event and to ensure more Night Market events happen in the future. Those who want to support the Waterloo Night Market initiative and future projects can visit the Hawkstarter page. 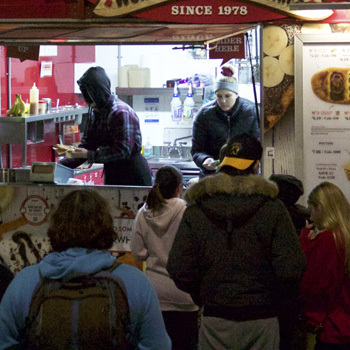 The Waterloo Night Market will be held on Nov. 25 from 5 to 9 p.m. in Waterloo Park in the parking lot off Young Street near the Park Inn. The event is free, although donations are welcome, and no registration is necessary.